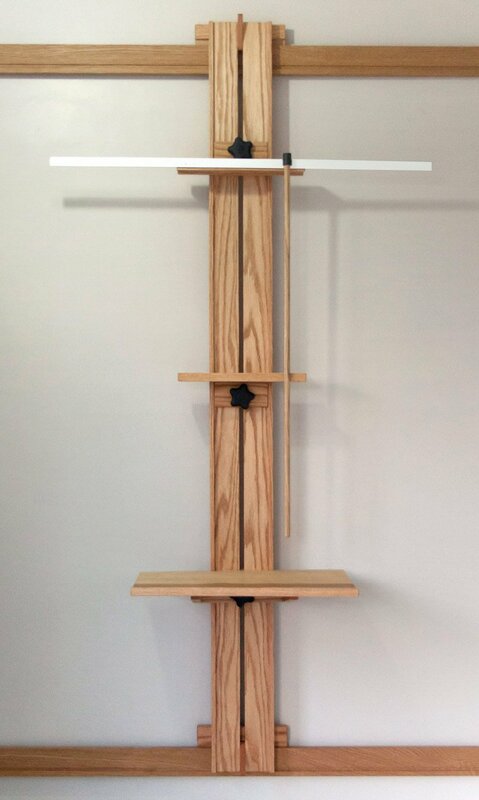 I now make and sell a wall-mounted easel system. Tueller Wall Easels are much more refined than my original space saving wall easel setup shown here. You can view the wall easel features on this page. They can be purchased directly from our shop. Our studio is small. Really small. Like, just a little over 260 square foot. So when I was getting it all set up for the first time, I knew I couldn’t have free standing easels out in the middle of the room. Just too cluttered. So I explored a few different designs for low-profile, wall mounted easels. The only commercially available wall mounted easels I could find didn’t meet my needs and were too expensive, given that I would need three or four. In the end, I designed and built my own. 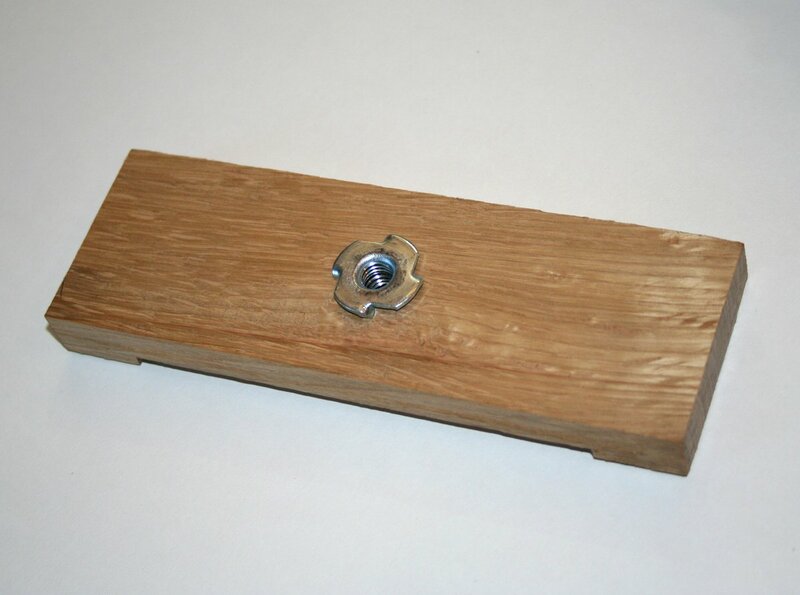 We had some 3/4″ oak boards on hand, so the entire project cost just a little over $20 for some hardware (threaded knobs, nuts and wood screws). While the studio is small, it does have one long uninterrupted interior wall where I could mount two 20′-0″ rails (one 2′-0″ up from the floor and the other 8′-0″ from the floor). The rails are attached to wooden spacers that keep them 3/4″ away from the wall. This allows me to hang as many easel masts as I need along the 20′-0″ span. I made a few trays that can be clamped onto the masts to hold brushes, pastels, paints and such. Shown here are three easel masts and one tool tray. Also, there’s a thin rail attached to the top of the center mast that allows me to hang a mahl stick to support my hand when painting. This close up shows the top of the mast and how it hangs over the rails, allowing me to move it anywhere along the length. I also built a couple of sets of ladder shelves to hold art supplies that I can move to whichever easels I’m working at. I’ve been using this set up for about seven months now and I’m pretty satisfied with how well it works. One of these days, I’ll get around to sanding it and giving it a nice coat of polyurethane. UPDATE 1: More photos, as requested. Canvas holder assembly. The upper and lower holders are built the same, the only difference is that they’re mounted on the masts in opposing directions. The grooves on the top are there to accommodate the hardboard panels I typically paint on. The dowels and corresponding holes keep the two pieces aligned when the knob is loosened. Tee-nut on back of clamp that receives the threaded knob. A view of the shelf attachment from underneath. 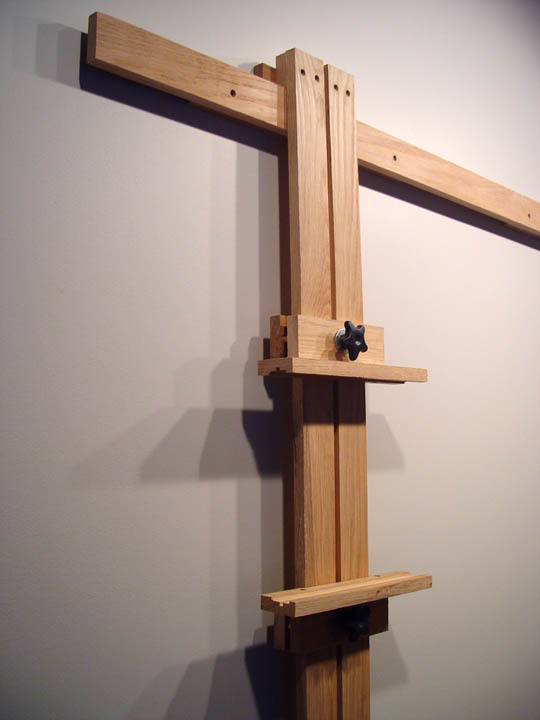 Looking for a wall-mounted easel for your studio? Tueller Wall Easels can be purchased on our online shop. Available in red oak, white oak and ebonized oak. What a great design idea. I have studio corners in different places in the house because of lack of space. Your rail idea looks like a possible solution. It certainly works for you! 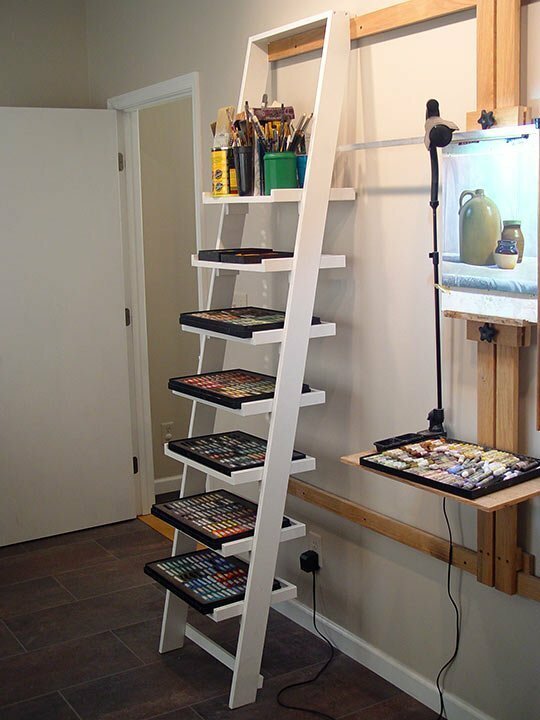 The ladder idea is brilliant too, I use a converted storage cart. Thanks for commenting Dianne. I’ve been pleased with the wall easel setup. I could still use more studio space, but what painter doesn’t say that? do you have any dimensions or other info on your above easel? am looking to build one like yours, looks great & is what I need for doing some large cavas’s. just wondering if they are 1×4 or 1×2 boards for the long horizontal stringers. also the vertical boards, are they 1×2? the blocks you have in the back that the horizontal stringers are mounted to, what are their dimensions? on the vertical boards that you have mounted side by side, what width is that slot? also wondering about the knobs, just the hardware store or? do you have a materials list? Hi Jeff. I’m glad you find it to your liking. It does indeed work well for large artworks as well as holding multiple artworks at one time. I don’t have a material list prepared. I basically made this up as I went along, using 3/4″ X 4″ oak lumber that I had on hand. The dimensions were essentially dictated by the materials I happened to have. I’m sure a similar setup could be made with 1″ X 4″ and 1″ x 2″ material. I’ve now added more photos. jason. many thanks for the info & the additional pictures. they will really help. you are quite a carpenter. I will try to build it out of oak also. looks better & stands up better. I can’t wait to get the thing built. have been looking & found another design that I liked, then ran into this one. really appreciate you sharing!! You’re very welcome Jeff. Good luck with building your wall easel! Hi Jason, these are really great. Can you shoot a closeup of the canvas holder? dori at funkydori dot com. Thanks! Thanks Dori. I’ve now added more photos. This is a brilliant wall design. So I would like to inquire did you make the clamps? I have been trying to configure something similar for my studio to accommodate several very large – 3part paintings on a 12ft wall. Hi Alexis. Glad you like it. This design does work well for large artworks since multiple masts can be used in conjunction with one another at the same height. I did make the clamps. I purchased the hardware, round knobs with 2 inch studs (3/8 x 16) and corresponding tee-nuts (3/8 inch x 16) from Amazon.com. I was fortunate to have a great deal of oak lumber on hand and a variety of wood working tools. Nearly everything on this project was done with a table saw, a cross-cut saw and a drill. Hope that’s helpful. Best of luck to you! I am finally getting around to starting this part of my studio projects. Just thinking about the build process and find my self wondering. Do the vertical masts slide left to right at all or are they stationary in the 3 set positions? Yes, the masts can be hung anywhere along the horizontal rails. They simply hang in place. I can slide them, although usually it’s just as easy to take them off and put them back on at a different location. The fit is just snug enough that the masts don’t wiggle about when I’m at work, but not so tight that moving them is a hassle. I have eight of the masts at this point (some to hold artworks, some with trays to hold pastels). Granted, I don’t typically need to have them all up at once. Good luck with your wall easel project! I love this idea and I’m building a copy-cat model for my studio apartment. Is there any ways you can send a side-view photo illustrating how they are screwed to the wall? It seems like you have a few pieces between the wall and the easel but I’m not sure how it all attaches to the wall. Toan, glad you like the design. 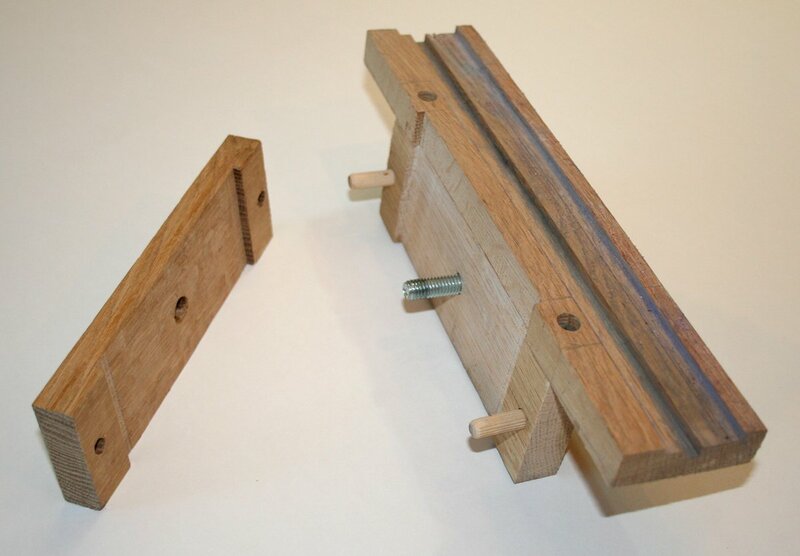 Basically, the rails are attached to a piece of wood that runs nearly the same length, but is a little shorter. This holds the rails out about 3/4″, creating a lip for the masts to hang over. I used a stud finder to mark the locations of the wall studs, then attached it with 1-1/2″ wood screws — long enough to penetrate the drywall and firmly to the stud. I used a forstner bit when I pre-drilled my holes so that the head of the screws are set below the surface. With the upper and lower pieces attached securely to the wall, I had something to screw the rails into. Thank you for sharing your excellent wall easel! Your work is beautiful too. Great easel design! I just converted one half of my garage into a home studio. It’s so nice to have dedicated space to work…right in the house! I am a sculptor but have been thinking about trying some painting now that I have space. I don’t want to take up floor space with a easel when space is a premium and sculpting stands have priority. Your wall easel is perfect. I have one long wall where this design would be ideal. Thanks for sharing. Judging by your woodworking skills, I think you have an additional income opportunity here. What artist doesn’t want that?! Assemble these as a kit (plans, hardware) for a reasonable price and voila! Nice work. I’m just glad I got the plans before you start selling them! Thank you Paul! I hope my easel design serves you well. When you complete yours, please send me a photos of your handiwork. Several people have done so and at some point I intend to write a followup post showing off their work. Amazing… hoping hubby can build one very similar. thanks for sharing! Jason, you are a God send! My wife and I just got a warehouse studio today and stumbled on your brilliant easel design. We are cramming her painting and ceramics along with my photo studio, woodworking and welding areas so I have to get creative. 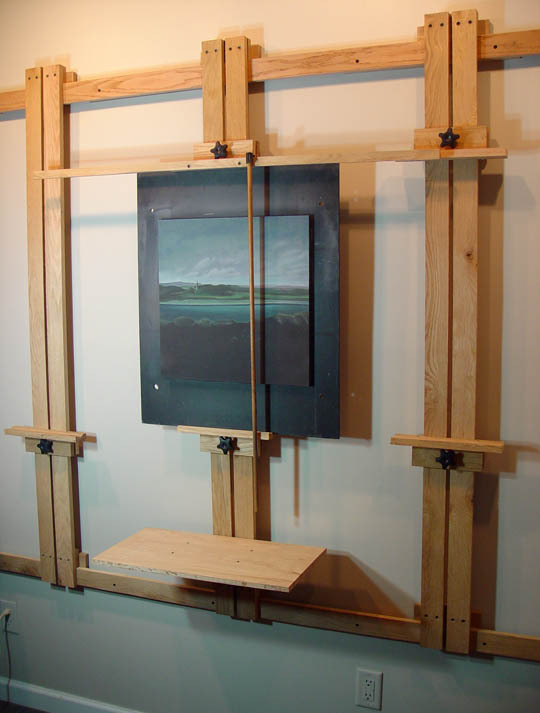 Going to make your easel all across one wall (about 60′) for painting and display. She is going to be so happy! Thank you for sharing. Hi Harry. You are very welcome. I’m very pleased that you like my easel design and find it useful! When you get it completed, please share some photos that I can post here. adjustable easel for such an economic price. Thank you Elizabeth! That’s very kind. Presently, I’m developing a number of wall easels to sell. I feel I’ve made some nice improvements to the design. A proper announcement is coming soon! What a wonderful idea. I want to build one as a gift to my daughter but she would like to possibly tilt the canvas when working. Any suggestions? Here’s a common (and low-tech) approach for allowing canvases to be tilted: Make the lower canvas holder a 5 or 6 inch deep flat tray with only a lip on the front edge. Then the upper canvas holder is something more like those I’ve shown here. The idea is that the flat lower tray allows the bottom of the canvas to be pushed forward or backward as desired and the top of the canvas just kind of pivots in place. It’s not a good solution for tilting a canvas a great deal, but you may find that quite a few commercially available easels use variations on that basic idea. I hope that makes sense. Best of luck to you on building the easel for your daughter. When you have it completed, please share a photo with us! On a side note: I have just started making and selling wall easels in the last couple of weeks. Very soon I’ll be adding several different types of canvas holders. These will include holders for larger canvases, adjustable depth canvas holders and adjustable depth panel holders (in addition to standard canvas/panel holders like those shown on this page). This is amazing! I’m moving into a studio 12/1/14 and wondering if one could be built by then. If so, how much? Thanks Raymund! I’m pleased that you like my wall easel design. It is possible that I will have the next batch of wall easels ready for purchase by then. However, I apologize that I cannot provide an exact date just yet. You will receive a notification email when I have more available. Presently, I build each easel by myself and I’ve been hard at work trying to meet demand. As for prices, please see the shop page to get a general idea. 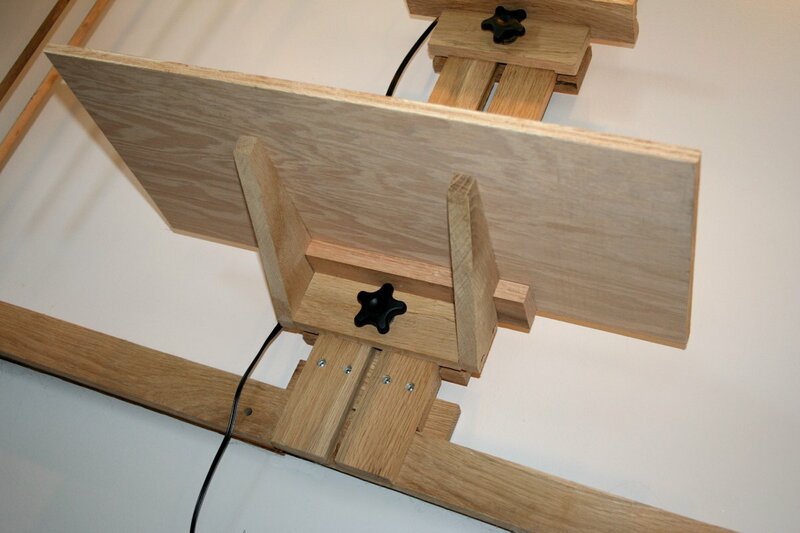 I will be adding more wall easel configurations and accessories in coming weeks. Thank you Ellen! I have been renovating my tiny shop and upgrading my woodworking tools so that I can make many more easels. I’ve been continuing to make improvements to the design and I’m really excited to get the next batch finished and into people’s studios. Regarding time: I am a stay-at-home dad, so finding time to work on the easels has been…challenging. The cold winter weather has slowed things down some too since my shed is uninsulated and unheated! It’s been an exciting time here at Paper Bird Studio. I will send out notifications as soon as possible. Thank you for your interest and your patience. Thank you so much for your brilliant ideas!!! You’re welcome Simon. Thanks for the compliment! Hi I love your wall mount easel design. Can it be scaled down for only 6″x6″ canvas panel? What would the dimensions be? I would need a lot of written instructions and photos as I am not really a diy’er. Thanks. Hi Thomas. I’m glad you like it. If I understand your question correctly, yes, the easels can accommodate really small painting surfaces as well as very large ones. I have intended to make detailed, step-by-step, illustrated construction plans available for download for a small price. However, since I began making and selling Tueller Wall Easels, the construction plans have kind of been put on the back burner. But it is still on my ‘to do’ list. The downloadable plans will explain how to build a wall easel that is very simple and can be made with materials commonly available at Lowes or similar. Further, these basic wall easels won’t require planers, routers or shapers and can be made with only a table saw, a drill and some general woodworking know-how. Is it possible to buy instructions to build with hardware list please? I need to build one to be able to house 3m canvas’. Hi Tracy. I am not selling plans at this time, sorry. 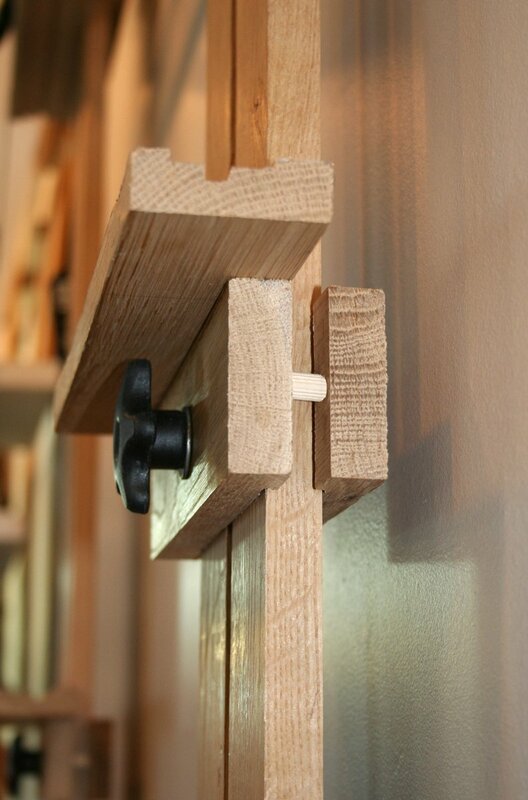 In the case of typical 2×4 framed walls, the wall rails are simply fastened with wood screws through the face and into the wall studs. I cut a shallow channel on the face of the rails so that the head of the screw is inset and doesn’t interfere with moving the masts from side to side. Hi Sue. Somehow, I missed your comment altogether, but I admit I am pretty bad about finding time to post on the blog in general! We stay pretty busy around here. I may make something similar as a standard product if there is a large enough demand. Until then, I can be requested to make custom holders to meet your specific needs. Could you show more pictures of the mahl stick attachment? Or do you make that? I am looking for a hanging mahl stick rail thingy. Hi Guenevere. 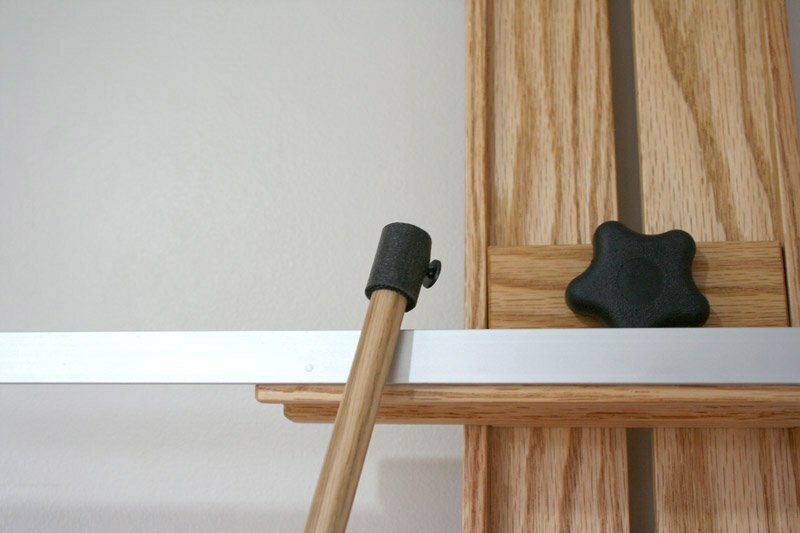 I can include hanging mahl stick attachments (upon request) for wall easels that I sell. They are quite simple. I pre-drill a couple holes into a length of flat anodized aluminum and mount it to the upper canvas holder with small finish nails. It’s positioned a little higher than the top edge of the canvas holder to create a lip that the mahl stick can hang over. The mahl stick is a length of oak dowel with a washer head screw at one end. This screw hangs over the top of the aluminum rail. Additionally, I wrap the top with a strip of rubber to keep it from scuffing and making noise as the mahl stick is moved along the rail. Of course, one can use longer lengths of aluminum rail and longer mahl sticks to accommodate larger paintings. 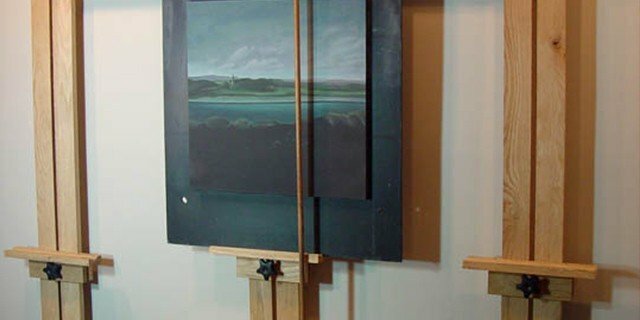 Some history: When I was about fifteen years old, I added a hanging mahl stick like this to my very first easel. I’ve been using the same basic setup on every easel I’ve had ever since. It’s proved itself to be a pretty good setup for artist who, like me, like to steady their hand when painting small details.